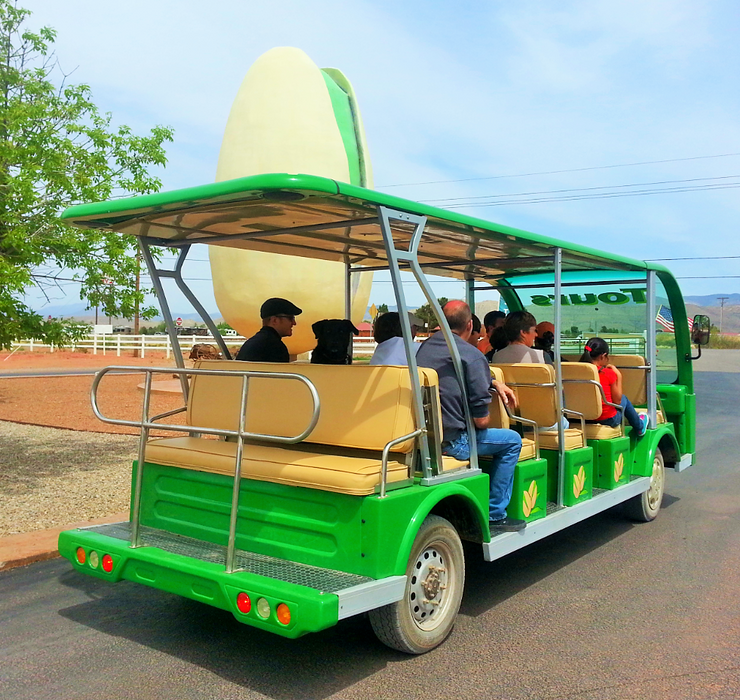 PistachioLand located outside of Alamogordo, NM is a destination that is enjoyed by all ages! It is the home of the World's Largest Pistachio, Pistachio Tree Ranch, McGinn's Country Store and Arena Blanca Winery. At PistachioLand, experience our motorized farm tour, take your photo with the World's Largest Pistachio, shop inside our country store for farm grown and hand crafted goodies, sit on our cool porch with views of the mountains, try our free samples at the pistachio bar, enjoy our wine tasting room, and grab a sweet treat in our PistachioLand ice cream parlor. There is so see and experience at McGinn's PistachioLand! open 10 a.m. to 5 p.m. every day at our #37 Highway 82 location. Farm Tour - Fun For All Ages!